crashed teh public-comments section of a Eugene City Council meeting. last month and in April. and crazy tendencies on the sane and sober population. the so-called Occupy: Eugene "movement." Again, the talk of "escalation" and "aggression"
are familiar tropes to seasoned Frisch-insanity watchers. 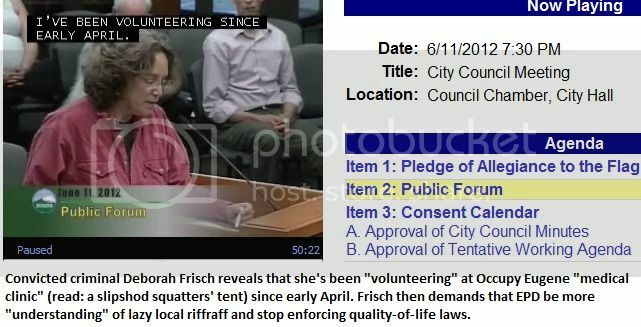 Unsurprisingly, Debbie Frisch also revealed her association with said vagrant riffraff. convicted criminal, "from 1 to 5 on Sundays since early April." It is unknown whether Miss Frisch's probation officer is yet aware of her latest activities. officer after a probation-violation hearing.